Russian champions CSKA Moscow are getting set for the resumption of the Premier League on March 4, and faced off with Sarpsborg 08 in a friendly at their training camp in Spain on Sunday evening. 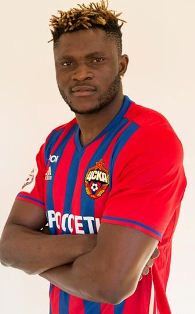 Aaron Samuel, who defended the colours of Sarpsborg 08 for one year before transferring to Guangzhou R&F in 2014, was included in the starting line-up of the Muscovites. However, the Super Eagles striker was replaced after only 11 minutes and it is unclear at this point why he was substituted. Goals from Mario Fernandez, Alan Dzagoev and Aleksandr Golovin gave CSKA a three-goal lead before Jørgen Strand Larsen netted a consolation for the Norwegian team in the 75th minute. In 31 outings for Sarpsborg 08, Samuel scored 13 goals and provided 5 assists.